NOTE: Use production metering rods for altitudes up to 3500 feet. Use high altitude metering rod s for altitudes above 3500 feet. IMPORTANT: Calibrations are identified by the CODE NUMBER and not by model number. 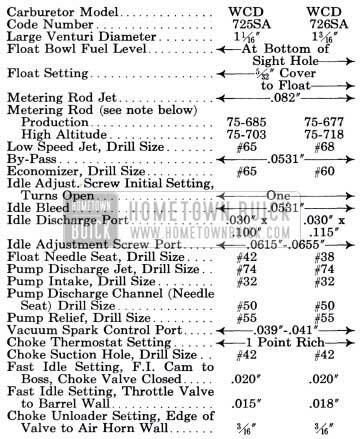 Carburetors of same mod el number but different code numbers are not interchangeable. The 1951 Buick gasoline tank is made of two halves ribbon-welded together at the central flanges. Two internal braces spot-welded to the upper half on the centerline of tank at the support seats act as struts to maintain the shape of tank and prevent its flexing from the weight of gasoline and pull of supporting straps. The 1951 Buick gasoline tank is attached by two strap type supports to the bod y under the trunk compartment, where it is seated against strips of anti-squeak material. The rear feed pipe, which is connected to the gasoline gauge tank unit is supported by clips on the bod y. The rear feed pipe and the front feed pipe, which is connected to the fuel pump, are joined by a rubber hose which provides the flexibility required by movement of the engine on its rubber mountings. Flared type fittings are used at all other feed pipe connections. The combination fuel and vacuum pump is mounted on the right side of crankcase at the front end and is driven directly from the engine camshaft. The construction and operation of the pump assembly is described in Section 3-D (par. 3-14). 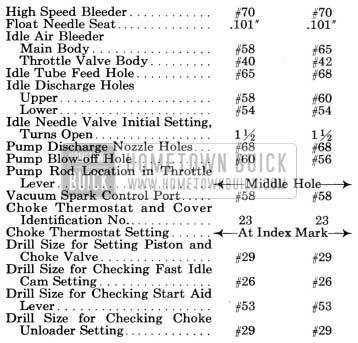 A Moraine gasoline filter is located at the gasoline inlet of the carburetor for the purpose of removing any dirt and water which may pass the filter contained in the fue1 pump. The filter contains a porous bronze filtering disk and is provided with a plug for draining out the accumulated dirt and water. See figure 3-7. Engines on all series are equipped in production with either Stromberg or Carter carburetors of the dual-barrel down draft type. 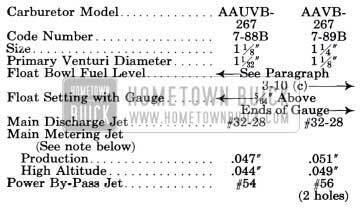 Either make of carburetor is considered” standard” and it is not intended that these units be interchanged to provide “optional” equipment. 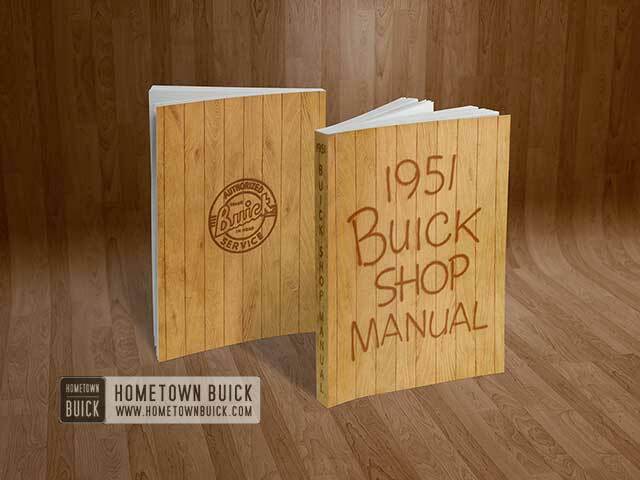 The 1951 Buick carburetor assembly incorporates an automatic choke and an accelerator vacuum switch. 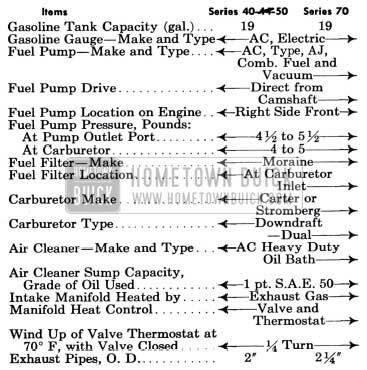 The construction and operation of the Carter carburetor and choke assembly is described in Section 3-E (par. 3-19 and 3-20) and the Stromberg assembly is described in Section 3-F (par. 3-26 and 3-27). The accelerator vacuum switches on both carburetors are described in Section 10-E (par. 10-32 and 10-33). All series engines are equipped with heavy duty oil bath air cleaners combined with intake silencers. The air cleaner removes abrasive dust and dirt from the air before it enters the engine through the carburetor. The intake silencer reduces to a very low level the roaring noise mad e by the air as it is drawn through the intake system. The cleaner and silencer also functions as a flame arrester in event of “back-fire” through the intake system. On Series 40-50, the air cleaner and silencer is mounted crosswise of engine, with the silencer supported by a bracket on the rocker arm cover. On Series 70, the air cleaner and silencer is mounted lengthwise of engine, with air cleaner supported on intake manifold. 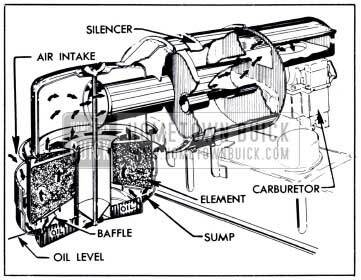 The 1951 Buick air cleaner consists of an oil sump and a cleaner element containing a filtering mesh which nests down into the sump above the oil level. The sump is filled with S.A.E. 50 engine oil to a predetermined level. When the throttle is closed, any excess oil on the filtering mesh drips back into the sump carrying the collected dirt with it. This dirt then settles to the bottom of the sump. 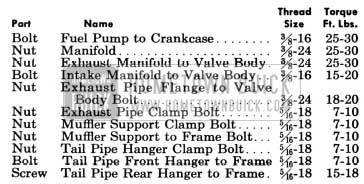 The 1951 Buick carburetor throttle control linkage is designed to provide positive control of the throttle valves through their entire range without being affected by movement of the engine in its rubber mountings. The linkage also serves to operate the accelerator vacuum switch when cranking the engine. The 1951 Buick dash pot is an atmospheric type in which a diaphragm and calibrated by-pass controls the closing of the throttle valves. The dash pot is sealed at assembly and no adjustment or other service is required. 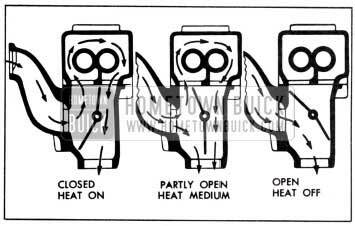 The 1951 Buick intake and exhaust manifolds are separate units jointed together by a valve body through which hot exhaust gasses may be directed into a heat jacket cast on the intake manifold to heat the area below the carburetor. The 1951 Buick intake manifold is of dual type with the carburetor mounted at the middle. The outside barrel of the carburetor feeds into the outside branch of the manifold to supply fuel to Nos. 1, 2, 7, and 8 cylinders while the inside barrel feeds into the inside branch to supply fuel to Nos. 3, 4, 5, and 6 cylinders. See figure 3-2. The exhaust manifold valve is offset or longer on the lower side of the shaft. This allows exhaust gas pressure to force the valve open when the engine is accelerated or operated with wide open throttle, thus reducing the heat to the in- take manifold. The valve is prevented from fluttering by a counterweight on the shaft. An anti-rattle spring is provided to prevent the valve from fluttering and rattling against the valve body in the open and closed position. The 1951 Buick muffler is a “straight through” type with resonance chambers which absorb and dampen out the exhaust sound waves. A slip joint at one end allows for expansion and contraction due to temperature changes. See figure 3-4. 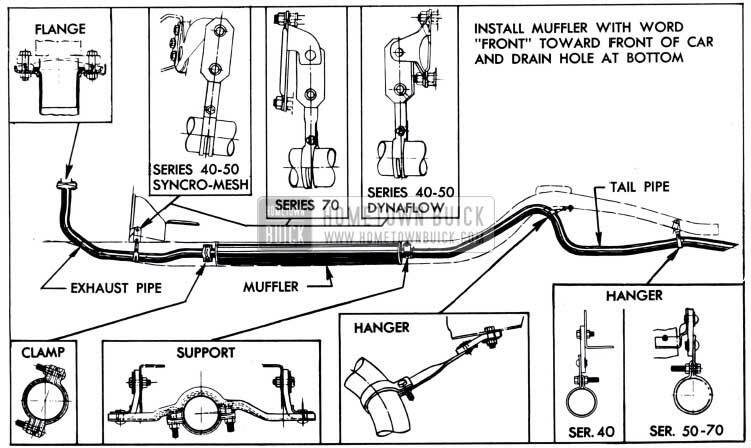 The 1951 Buick exhaust pipe is connected to the exhaust manifold by a bolted flange and a gasket. The exhaust pipe and tail pipe connect to the muffler through slip joints provided with clamps. All exhaust system parts are flexibly mounted to allow for engine movement and for expansion and contraction due to temperature changes. All supports have fabric straps which provide the required flexibility and also serve to insulate exhaust system vibration from the chassis. See figure 3-5.